A while ago, while obsessing about New York’s Metropolitan Transportation Authority and its obsession with turning what might have once merely been viewed as functional municipal signage or insignia into “IP ,” I made fun of the MTA’s trademark application (since approved) for IF YOU SEE SOMETHING, SAY SOMETHING. In 2002, the transportation agency saw a need for a security-awareness campaign to encourage customers to report suspicious activity or unattended packages, and they turned to Mr. Kay, who still had the phrase on his index card. By January 2003, the slogan was on posters and placards in subway cars, buses and trains. It has since become a global phenomenon — the homeland security equivalent of the “Just Do It” Nike advertisement — and has appeared in public transportation systems in Oregon, Texas, Florida, Australia and Canada, among others. Locally, the phrase captured, with six simple words and one comma, the security consciousness and dread of the times, the “I â™¥ NY” of post-9/11 New York City. The transportation authority received a trademark on the slogan from the United States Patent and Trademark Office, though unauthorized uses appear to outnumber authorized ones. Did you know, by the way, that you can “receive a trademark” from the PTO? I didn’t. I thought they only registered trademarks, which are otherwise earned by use that rises to the level of establishing a secondary meaning! Silly me. So the end of that distinction, manifested of course by the common use of “trademark” as a verb, is now official, for it is no longer recognized among reporters or their diligent, triple-checking editorial phalanxes at the Newspaper of Record. This says it all about what “trademarking” has become, unfortunately; as to “journalism,” well, what do I know? Since obtaining the trademark [registration] in 2007, the authority has granted permission to use the phrase in public awareness campaigns to 54 organizations in the United States and overseas, like [sic] Amtrak, the Chicago Transit Authority, the emergency management office at Stony Brook University and three states in Australia. The authority has not charged for such uses of the slogan. Some requests have been rejected, including one from a university that wanted to use it to address a series of dormitory burglaries. “The intent of the slogan is to focus on terrorism activity, not crime, and we felt that use in other spheres would water down its effectiveness,” said Christopher Boylan, an M.T.A. spokesman. Wait, wait–there’s also some distinction between crime and terrorism? That’s something I also thought had gone by the boards–especially at the Times, which once seemed clear on the difference but now, maybe not so much. As I said, what do I know, besides a little about trademark law? Just what I see. And maybe I’ve already said… enough. UPDATE: More on this from Daniel Corbett. MORE: They’re not stopping, and evidently they’re getting very little pushback… (sigh). Exactly what goods and services is the phrase being used to identify the source of? Isn’t that a requirement for a trademark? G & S: Promoting public awareness of public safety and security issues. Here’s the complete registration certificate. Doesn’t there have to be interstate commerce for a federal registration? Does the MTA go to New Jersey or Connecticut? I have some issues with how this qualifies as trademark use, but perhaps I’m not familiar with slogans-turned-registrations for services. It seems the mark is the message itself here; how is it being used in connection with the sale or advertising of the MTA’s services? The Office Action response just pointed to other registrations and said “they did it, too.” Does anyone have some law to which they can direct me? Dan Tobias is right. “Promoting public awareness of public safety and security issues” is not commerce. It ain’t a service and it ain’t a product. Let’s cancel it. Does anybody here have standing? A concise, non-precedential TTAB decision addressing whether a slogan operates as a mark or not is here: http://j.mp/aAqXKt . 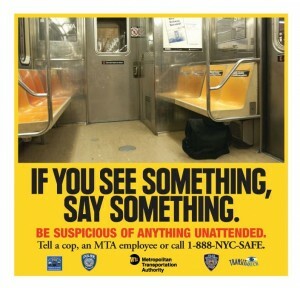 I agree with Tal: IF YOU SEE SOMETHING, SAY SOMETHING ain’t a mark. Well, Dan, I’ve been doing that for five years. Thanks, Dan. I’ll check that decision out. One big reason silly marks like this exist is that others are fooled into thinking they need to ask permission. That campus police force who wanted to use this purely descriptive slogan for crime should have just gone ahead. Don’t ask for permission. Solid defense– they’re not using it as a mark. In the event the MTA actually sues in another jurisdiction, just embarrass them publicly for squandering MTA funds on non-transit litigation.